Located in Jersey City on the New York Harbor — less than 2,000 feet from the Statue of Liberty — Liberty State Park was once a major waterfront industrial area with an extensive freight and passenger transportation network. In fact, it once housed the Central Railroad of New Jersey Terminal (CRRNJ) which served to transport immigrants arriving at Ellis Island to other parts of the United States. As the railroads and industry declined, the land was abandoned and became a desolate dump site. Converted to a recreational area in June 1976, the 1,122 acre modern urban state park revitalized the area and currently welcomes more than 5 million visitors annually. 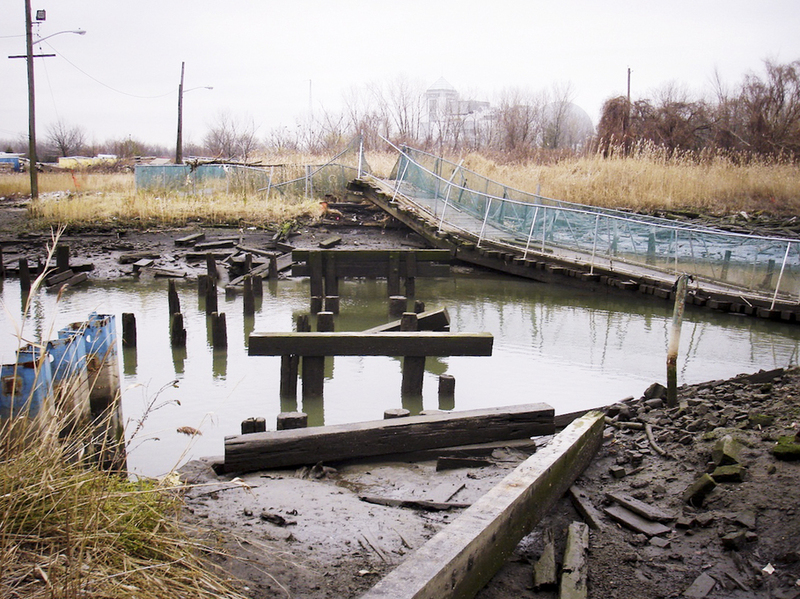 In October 2012, Hurricane Sandy swept through the area moving a pedestrian bridge, which had originally served as a rail bridge, 30' off alignment. In fact, it is estimated that the park suffered $20 million in damages during the superstorm. Since the bridge provided access to the park for pedestrians and cyclists, Jersey City contacted T&M Associates requesting that a replacement bridge be installed as quickly as possible. With the help of specialists from the Federal Emergency Management Agency's (FEMA) Environmental and Historic Preservation program, the City developed a plan for reconstructing the bridge. The original bridge traversed environmentally sensitive wetlands so it was important that the new bridge occupy the original bridge's footprint minimizing its impact on the surrounding area. As a solution, a 120' x 10' Keystone®-style, Continental® steel truss bridge with a wood deck was delivered to the site in two sections, assembled on site and then lifted into place via crane. During the opening ceremony, Mayor Jerramiah Healy stated, "Hurricane Sandy came in and wiped out the footbridge that we had, but it might have been a favor in disguise because we now have a much more sturdy, much more aesthetically pleasing bridge for our citizens from all over Jersey City to gain access to one of the greatest parks in the United States, Liberty State Park." The new bridge was officially renamed the "Ethel Pesin Liberty Footbridge" in honor of the woman who originally worked to establish the park in the 1970's. The new pedestrian structure is wider, longer and safer since safety rails were included in the new design. Reconstruction of the pedestrian bridge came in on time and under budget.